The IT industry has made tremendous progress innovating up and down the computing stack to enable and take advantage of non-volatile memory (NVM). But questions still remain on where NVM plays in the memory stack, how it will evolve in the CPU architecture, and where operating systems will need to be enhanced. 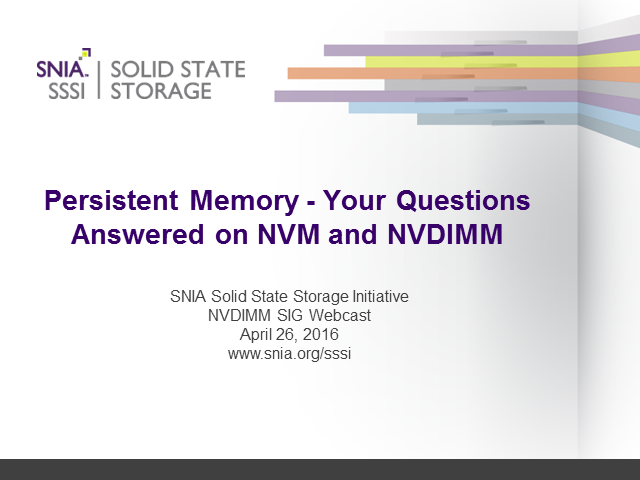 Join the SNIA NVDIMM Special Interest Group to learn about the latest developments in NVDIMM, understand how the SNIA NVM Programming Model can be applied in NVM development work, and find your NVM answers!